Thinking outside the box is something EnviroGLAS Products principal Tim Whaley does well. Nicknamed “Scrappy” by the Dallas Business Journal, the Texas entrepreneur was granted a U.S. patent in 2003 for developing the “method of making a terrazzo surface from recycled glass.” The idea for combining the multi-colored crystals with epoxy resin to create recycled glass terrazzo came to him after he saw a news story in July 2002 about Plano, TX’s overabundance of crushed recycled glass. Two years and several awards later (including the Recycling Alliance of Texas’s 2003 “Closing the Loop Program” award and the Texas Environmental Excellence Award for small business in 2005) Whaley is at it again. This time it was the City of Dallas who asked him if he could do anything with a bunch of old toilets and commodes. The juices started flowing and soon EnviroMODE™ was born. This brand new terrazzo surface is made from recycled tubs, sinks and toilets. It’s easy to maintain, durable, eco-friendly and beautiful. Available in hundreds of resin colors, the bone-colored porcelain looks fantastic in neutral and earth-toned resins, and really pops in bold resin colors like black, yellow, blue and red, shown here. “I am always looking for companies that are creating new and innovative products from recycled materials,” said City of Dallas Recycling Manager Sherlyn McAnally. “The crushed porcelain has a beautiful pearl-like finish and can be used in a versatile array of applications,” she noted. 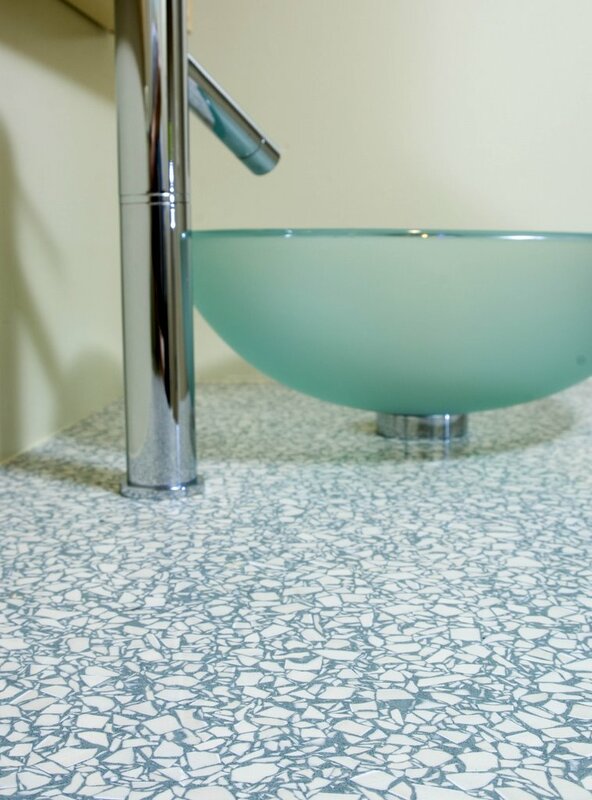 EnviroGLAS offers EnviroMODE terrazzo as well as its recycled glass terrazzo finishes in a countertop product called EnviroSLAB™ and in rectangular tiles called EnviroPLANK™ for flooring, walls and other creative uses. Both the recycled glass and porcelain can also be used as aggregate in traditional poured in place terrazzo flooring. What’s more, the two types of aggregate can be mixed together for a more complex design. The first installation of an EnviroMODE EnviroSLAB is in a Chicago area home basement, the renovation of which will air on the HGTV program “New Spaces” in November. The basement remodel creates a warm and welcoming, and also environmentally friendly family room and media/entertainment center with an adjacent bathroom where EnviroMODE is the focal point. “This material is a very ingenious product and a great way to ‘close the loop’ in recycling,” said project designer Karen Kaplan. “And it’s great looking as well,” she added. EnviroMODE Terrazzo floor PLANKS and samples will be on display at the EnviroGLAS Products booth at the Greenbuild International Conference and Expo in Denver next week. Anyone interested in EnviroMODE is encouraged to stop by to see, touch and walk on this revolutionary application. Heat and scratch resistant, EnviroMODE and EnviroGLAS surfaces are highly resistant to common stains and are easily cleaned with neutral cleansers. The products are VOC-free and do not require a seal. Good 411 on Eviro products. We are considering these for our remodel. Anybody used them? I also found a good list of other “eco-friendly” countertop alternatives (btw they all steered us away from granite). The site I found this on was http://www.getwithgreen.com under their countertop section.